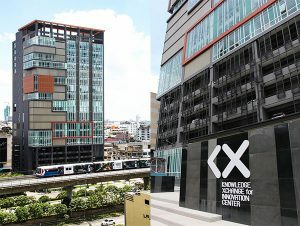 King Mongkut University of Technology Thonburi (KMUTT) has a city campus in form of a 20 floors building (including the basement) on Krung Thonburi road near the BTS Skytrain “Wong Wian Yai” station, just across the Chao Phaya river from the Sathorn road via the Taksin bridge. Its total area is approximately 28,000 square meters, or around 1,300-1,400 square meters per floor. Take the BTS Skytrain to either Krung Thon Buri or Wongwian Yai BTS station. 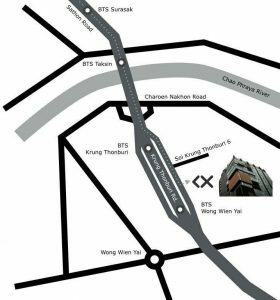 From either station, it is a short walk of less than 500 m on Krung Thonburi Road to the KX building. Bangkok has two international airports, Suvarnabhumi International Airport (BKK) to the west of the city which handles most of the international flights, and Don Mueang International Airport (DMK) to the north of the city which handles low-cost carriers. From Don Mueang International Airport (DMK) the fare to get to your hotel or to KX/KMUTT is lower, and should be in the vicinity of 300 Baht. For more information refer to this guide on Don Mueang Airport Transportation.